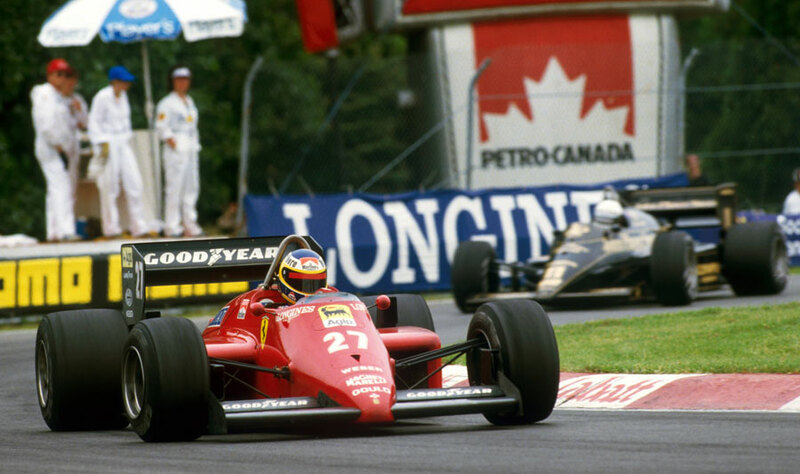 Michele Alboreto moved to the top of the drivers' championship with victory at the Canadian Grand Prix but Elio de Angelis did not give up first place without a fight, pressurising the Ferrari until the tyres on his Lotus began to fade. The month between the previous race in Monaco and the roadshow reassembling in Montreal was interrupted by the cancelled Belgian Grand Prix at Spa, where the disintegration of a newly relaid surface led to the event being scrapped on safety grounds. Elio de Angelis gave Lotus its fourth successive pole position alongside team-mate Ayrton Senna and the pair led Alboreto for five laps until Senna was forced to pit with a loss of turbo pressure. He could only resume after a delay which left him five laps adrift. On the 22nd lap de Angelis was passed by Alboreto as the pair got caught up in tailenders, and although de Angelis battled hard, in the end his tyres let him down, so much so that Stefan Johansson was able to overtake him 16 laps out to ensure a Ferrari one-two. The Lotus was in such trouble that Alain Prost and Keke Rosberg also passed him in the final stages. The Ferraris did not race each other as team orders came to the fore, but Prost finished so strongly the gap between his McLaren and the leaders was slashed to a little over four seconds when the chequered flag came down. Had he not been baulked by backmarkers over the last couple of laps he might have caught Johansson. Alboreto was not worried. "I soon realised I had more power than de Angelis and the choice of tyres turned out to be right. Our car is good anywhere. I am sure we will be good on the street circuit of Detroit." As he was to find out the following weekend, the Ferrari was good … but not quite good enough.